I am far from an investment expert – and I’ve never tried to be one. I’ve always contended that a financial advisor has a very different skillset than an accountant – and that those who try to be both are rarely good at either. This was created by a multi-level marketing company called “Karatbars” (a type of “business” whose legitimacy is a whole different discussion). But even taking that into consideration, it is easily the stupidest thing I’ve seen in a while. The “loss” of the dollar’s purchasing power is adjusted for inflation and assumes you would have put the cash in your mattress or dug a hole and left it there. No investment in the stock market, no purchase of real estate, no interest from a bank, NOTHING. The gold ROI is not adjusted for inflation. If it were, the increase would be closer to 259%…or an annual return of a whopping 3%. That 3% becomes even less impressive when you compare it to the approximate 8% (inflation adjusted) return the Dow Jones Industrial Average has provided over that same period – more than double gold’s rate of return. 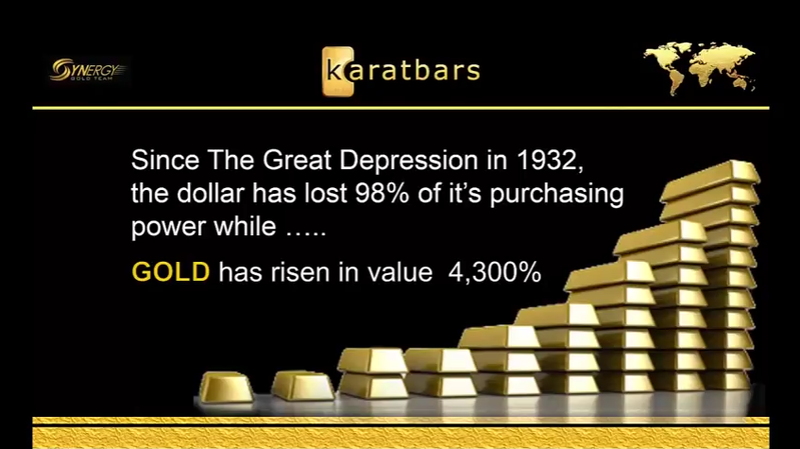 Using Karatbars 4,300% figure for gold – that means that a $1,000 investment in 1932 in gold would today be worth $43,000. The stock market – including dividends paid – over that same period would have resulted in $1,000 growing to about $390,000. Hmm….$42,000 vs. $390,000. I suppose you shouldn’t expect better from an MLM whose business is selling gold bars. But claims about gold and other “safe” investments seem to pop up rather frequently. Is gold a scam? Is it an inherently bad investment? Should you remove it from your portfolio? Absolutely not. 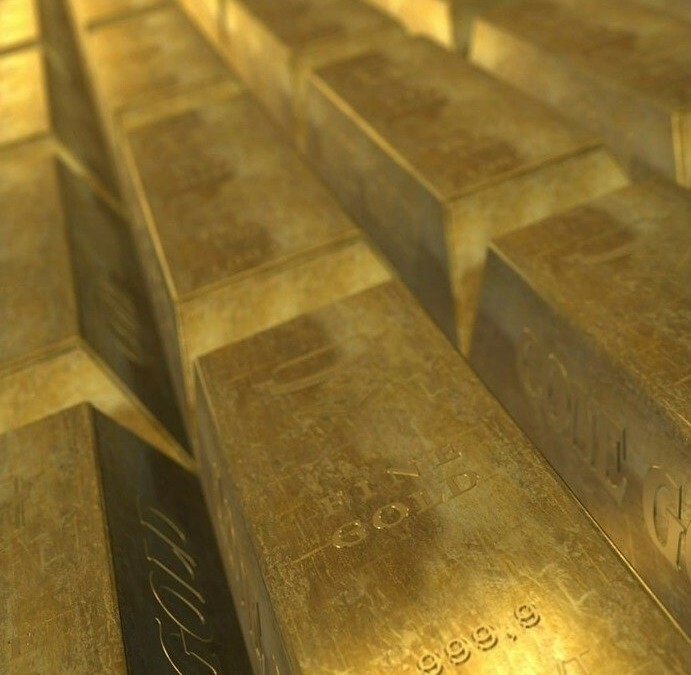 Gold, like any other investment vehicle, has its place and should probably be in every portfolio as a hedge, since it may do well when gold or real estate or other investments are going through a declining period. But like any other investment, it is not without risks. For example, consider two times when economic conditions were uncertain and gold price spiked: 1980 and 2011. In 1980 gold hit $850 and in 2011 $1,800. If you invested in gold in 1980 it took you 25 years just to break even. If you invested in 2011 you aren’t anywhere close to getting your money back. In fact, your gold is only worth 70% of what you bought it for during a period where the Dow went up over 7,000 points. All from the “safest” investment. I see this all the time when people talk about wanting to avoid risk. Even “risk free” investments like savings accounts or CDs can have serious opportunity cost. For example, assume you saved $1,000 per year for 45 years for retirement. You can’t stand the idea of losing money, so you put it in bonds and CDs that yield 2% return per year. At the end of the 45 years you’d have $82,000. 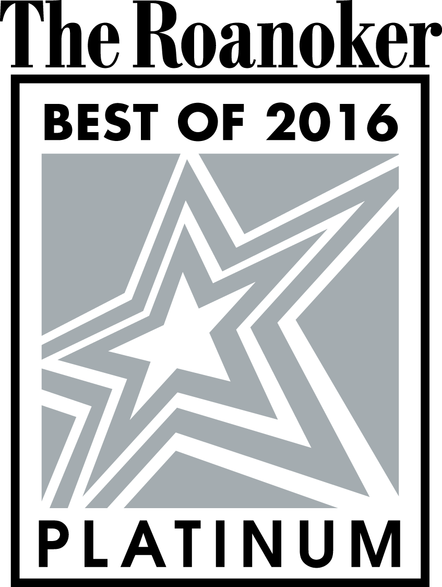 Not too shabby, we think. Until you compare it to what you would have gotten if you had invested in the market and gotten an 8% return. In that scenario you would end up with nearly $420,000. There were periods where it likely would have gone way up and way down, but in the end it still yielded a significant amount more. And the biggest drawback to having all of one’s investments in CDs or other safe-money instruments is that they do not generally provide much of a return, if any, above and beyond inflation. For example, you put $2 (the cost of a loaf of bread) in a bank and get an average of say 3% over a period of time. In 24 years at that rate your $2 is worth $4 – double. (And yes it takes that long.) Now if inflation has also averaged 3% during that period…congratulations. You can still buy the same loaf of bread. You broke even. But there was no return above and beyond (the money for the peanut butter and the jelly.) When we are saving for retirement or other long-term needs it is vital to have a real return – over and above just the rate of inflation/price increases so that our money can really accomplish our goals. So even conservative investments are not without their own varieties of risk. There are of course reasons and times to have lower risk, lower yield investments. It is important to have a portion of one’s portfolio in liquid, safe, guaranteed instruments (CDs, savings accounts, etc.) to care for cash needs and unexpected occurrences. And sure, even some gold or silver for diversification may not be a bad idea – for the times when the market goes through a rough patch. But don’t let DIY financial “experts” try to convince you otherwise: this stuff is complicated. I know more than most people and I never try to tell people what to invest in. That’s what qualified financial advisors are for. Find one or give me a shout and I can give you some recommendations.